“OFFLINE PROGRAM from CAD - CONVERT BETWEEN CONTROLS - EDIT EXISTING PROGRAMS"
MazaCAM – Direct Mazatrol programming on your PC. Write Programs while your Mazaks are running, on your PC, or on your laptop for programming on the move. Edit existing Mazatrol programs, or start writing new ones, using easy-to-use Windows interface. You can also keep your Mazatrol control’s memory free. Upload and download Mazatrol programs between the Mazatrol controls and your PC. Store programs on your PC for later user. Also compatible with Fusion floppy-disk, netwok, flash-card, USB Drive, and the Micro-Disk. Compare your programs to see any differences between the program you sent to the machine and the program sent back to the machine. Use your favourite file-compare program. Back-plot your Mazatrol to geometry, similar to working on your Mazak machine. Further, you can interactively view the shape of the part as you program. Show the tool-path, make tool-sheets, run-time estimation, check coordinates, check shape geometry, dynamic rotation, and much more. Supports the broad line of Mazak Controls from the first T1 to Modern Nexus and e-Machine. “Closer look at Program and Edit your Mazak Mazatrol with MazaCAM Editor. As Simple as Programming on your control in familiar screens”. “Overview on how MazaCAM can enhance your Mazatrol Control ,from downloading direct from the control , to converting between control types and offline programming by importing direct from IGES files into your Mazatrol program”. “Program from Solid and 2D Cad files including 3D toolpaths”. “Convert Programs from T+ & M+ to new SmoothX control. Convert across control form Fusion640MT to Matrix and Smooth”. “Create Engraving then output as Manual Mazatrol Program”. “Trochoidal Mill on your Mazak without having to use ISO program. Keep all within a Manual Mazatrol Unit”. 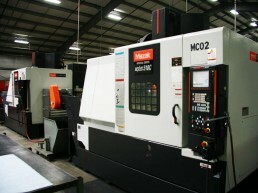 MazaCAM is not affiliated to Yamazaki Mazak Machinery or endorsed by them in any way. “All rights reserved. MazaCAM is a trademark owned by Basic NC Inc. Mazak is a trademark owned by Yamazaki Mazak Corporation. All other trademarks are the properties of their respective owners. OFFLINE PROGRAM from CAD - CONVERT BETWEEN CONTROLS - EDIT EXISTING PROGRAMS.